Its taken months of work but we have finally managed to get Marasites back. You cannot edit your Marasite or create a new one yet, that is still being finished off and should be finished in a week or so. But those who had Marasites will find that their site now loads again and is linked from their profile. Thanks for your patience so far. The Salon now has 3 new hairstyles for female characters! A new DNA Minipet has been discovered. You can now breed a Chibs with an Xoi to get a Choi. The Barbers now has 3 new hairstyles for male characters! There are a 3 hairstyles that still cannot be changed coloured with hair dye and are stuck at one colour. Laimay will fix this later this week. We have just added more prizes to our Loyalty Prizes run by King Baspinar. He rewards Maradans for how long they have been playing. Prizes now go up to 16 Months Old for those who have old accounts. Thanks for playing Marapets!! A new Undying Minipet has been discovered! That means there are 50 new bones for you to grab when you go Grave Robbing and a new minipet for you to resurrect! Can you find the Undying Minipets avatar we've hidden? This is just a sneak preview of one of our new Skeleton Pets! We have a new mission coming out in Undying Woods really soon, and a Skeleton Costume will be one of the prizes. The Lottery has been drawn for this week. fatduck is the winner of the 784,600MP Jackpot with the winning numbers of 15, 1, 9, 25, 20 and 18! Congratulations! Last Week's Raffle has now ended. mrsjohnkrasinski is the winner of the Red DNA and 100,000MP prize with the winning raffle ticket number 30076! Congratulations! Make sure you buy your tickets for today's raffle - only 10MP per ticket! The Eleka Prison has just opened in Eleka's Castle. Minipets inside this prison are not fed and need to be fed Minipet Food. If you manage to feed one of them, you will be rewarded with RP and a Circus Ticket which will be important soon, when the Circus opens in Slater Park. Now that Eleka's Castle is almost full, the next few weeks of news will be mostly based around Undying Woods, leading up to the Undying Festival sometime in July. We have redrawn the Undying Woods map to make it look a lot nicer, more organised and to make room for some of the cool new stuff for this world! There was a problem with Undying Minipets that has just been fixed. You can now create them. The June Account Upgrade is now on sale! Wondering what the bones from Grave Robbing are for? Wondering what the blood in the Account Upgrades is for? We have just released a new feature in the Undying Woods called Undying Minipets. Undying Minipets are a different type of minipet. Undying Minipets are minipets that have been brought back from the dead in Undying Woods. A Murfin called Franken can perform the resurrections in Undying Woods if you bring him the correct bones and some blood. Every Undying Minipet has five different bones, and each bone comes in a different colour. You will need to bring 5 of the same colour and species bones and a blood item of the same colour as the bones to Franken and he will perform the resurrection for you. We have just released the June Account Upgrades. Hold your stomach! This month has a.. gross theme... Much of the rest of the month will be spent on Undying Woods and we'll also have a new annual event called the Undying Festival. This month's upgrade is themed after Undying Woods. Here are some of the... interesting... items avaliable this month! For starters, we have the Insideout Costume! These pets were turned insideout and still look freakishly cute.. There is a new book, cd, dvd and pearl..
We have a Gross Trading Card to battle this interesting opponent in the arena. And finally, the main items in this month's upgrades are Blood. These are avaliable in 8 different colours and you can choose what one you woud like. What is it for? These items have the power to bring prehistoric Undying Minipets back to life in Undying Woods. All you need to do is find the bones for a certain Undying Minipets, bring the blood that is the same colour as the bones and you can bring this minipet back to life! You will find out more later in the week..
A new shop has just opened up on Mini Pet Island. The shop sells Minipet Food, which is not to feed the minipets you have equipped to pets, but to soon feed the starving minipets at the Eleka Prison which will be out really soon. REMINDER : The October Account Upgrades will be retiring this week, and it could be as soon as tomorrow! This will be your last chance to buy this at the upgrades page! The December upgrades will also increase in price as it becomes an Archive Account Upgrade. The June Account Upgrades are on their way! We have just added Grave Robbing in Undying Woods. 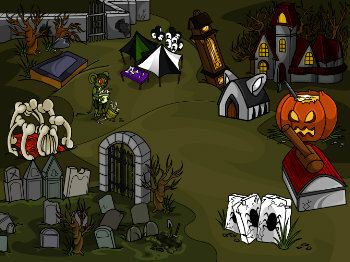 Every 3 hours, the grave keeper who guards the graves falls asleep, allowing you to dig up a grave and rob what you find! Its both evil and illegal, so if you get caught, all of your pets will go to prison! You can find MP and Bones. These bones are of prehistoric Undying Minipets. You will find out what they are later this week! This new Game has been added to the Undying Woods map and the Countdown in Ziranek. This new feature has been added to the Enpiah map and the Dress Up Games section of the site. We have just released a new feature to the site which we have been developing for a long time now. Pet Trades has just been added to the Eleka's Castle map. Pet Trades works like the Pet Exchange, but instead of sending a pet to another player, you trade up to 5 of your pets for up to 5 of someone else's pets. You still both have to pay the Pet Exchange fees for trading pets, but this should provide you with a safe way to trade pets! Plus, as an added benefit for those who do not trade pets, all pets that are in Trading cannot gain random stats! This is a new feature so if you spot any mistakes or errors with it, please let us know right away on the bugs/errors forum. We have a brand new Flash Game for you to play. Item Collector has been added to the Arcade Games category of the games section. Can you find this new Secret Blog that we have just hidden? About time right? The Lottery has been drawn for this week. lunandale is the winner of the 750,500MP Jackpot with the winning numbers of 2, 8, 12, 14, 22 and 7! Congratulations! Last Week's Raffle has now ended. rockinpuppy1212 is the winner of the Red DNA and 100,000MP prize with the winning raffle ticket number 52975! Congratulations! Make sure you buy your tickets for today's raffle - only 10MP per ticket! The Eleka Tombola has just been released in Eleka's Castle. Similar to the Tombola in Baspinar's Castle, but instead of BP, it gives out RP and instead of Hair Cut coupons, it gives out evil Plastic Surgery coupons! There are also lots of other new prizes from this game. You can play once every 8 hours for FREE. We have added the this Tombola and the Photo Booth to the Countdown. Can you find the Eleka Tombola avatar? The Eleka's Castle map has also been updated. A Charity Shop has just opened in Puchalla Village. This old Reese restocks the charity shop every 5 minutes with random items, selling them at half the price of the normal shops! It restocks 1 minute before all of the other shops on the site. The Puchalla Village map has been updated. Can you find this Charity avatar we have hidden? The Smuggling in Dukka Caves has been fixed now. We have also added a couple of new items to it. We have a new shop in Baspinar's Castle for you to restock! This shop sells Sunglasses which are one-use items for your characters! This is also the first BP restocking shop that sells items for BP! Can you find this Toddler Avatar? We have also revamped the Dress Up Games section of the site. You can also find it added to the Games section. This page now has everything you need to know about Characters, and links to all places related to them! The Treasure Maps shop on Mini Pet Island is now selling the Whirlpool & Fishing Treasure maps for RP. Will you help this new, poor Old Leido across the street? The Gigantic Paradise Leprechaun arrived nearly 500 years ago, after getting on the wrong flight from Ireland. Ever since he has lived at the end of the rainbow, giving out quests for items that he needs. If you can bring him the items that he needs before his deadline, he'll reward you with RP from his pots of gold! Can you find the Leprechaun hidden avatar?